WEST of the Alleghanies the campaign of 1862 opened in the beginning of February. The Confederates under Albert S. Johnston held a line running from Columbus on the Mississippi to Bowling Green, and by holding this advanced position retained possession of a considerable part of Kentucky. Facing them were General Buell, commanding the Department of the Ohio, who had concentrated the bulk of his forces at Nolin in order to confront Johnston's main force at Bowling Green, and General Halleck commanding the Department of the Missouri. The latter had been too much occupied with restoring order out of the confusion which Frémont had left behind him, to be able to pay much attention to affairs east of the Mississippi. But one of his lieutenants, Grant, was in command at Cairo. It was he who, in September of the preceding year, had forestalled the Confederate general Polk by seizing Paducah, and in November had moved down the Mississippi with a small force, and fought an indecisive battle with some of Polk's troops at Belmont opposite Columbus: and he fully appreciated the importance of the issue which was about to be fought out in Kentucky and Tennessee. The Confederate position was one of considerable danger. Although they held the interior lines, and at that time of year the wretched condition of the roads and the swollen streams presented almost insuperable obstacles to any large force operating by land, yet the rivers Cumberland and Tennessee afforded an easy advance by water into the very heart of the Confederate power in the West. The Confederates were painfully aware of their inferiority on water. The superior mechanical skill of the Northerners gave them an immense advantage in any combat which might be fought out on the Mississippi and its tributaries. In the West the Confederates had aimed not so much at building gunboats which might resist the advance of the Federal vessels as at securing strongly fortified positions on the rivers, which would prevent the ships of their foe from moving up and down at pleasure on their waters. On the Mississippi, above Memphis, they held strong positions at Fort Pillow, New Madrid and Island No. 10, and Columbus. On the Cumberland and the Tennessee they had constructed Forts Donelson and Henry to protect the waterway to Nashville and the Memphis and Charleston Railway. Buell, with a full appreciation of the military situation, had been throughout the winter urging upon McClellan the advisability of a combined movement by land and water upon Nashville. But Halleck had been too much occupied with his own difficulties in Missouri, and McClellan, partly on political grounds, favoured an advance into East Tennessee. Suddenly Halleck flung aside his old objections, and on the 30th January sent word to McClellan that he was ordering Grant to move up the Tennessee and capture Fort Henry. It is not clear why Halleck so suddenly changed his mind. In all probability he had been convinced by the representations of Grant and Commodore Foote, who was in command of the naval force, that a movement against Forts Henry and Donelson might lead to great results. He was a man of considerable ambition and anxious to rival the success of Buell, one of whose lieutenants, G. H. Thomas, had recently gained a victory at Mill Springs and he hoped by despatching Grant on this expedition to force the hand of the Government and compel McClellan to abandon his cherished scheme against East Tennessee and give him all the assistance that he could towards effecting the reduction of the Confederate forts. These two fortified posts had been constructed in the summer of 1861 by direction of the authorities of Tennessee. Fort Henry lay on the east bank of the Tennessee, and twelve miles away was Fort Donelson on the west bank of the Cumberland. The sites, especially in the case of Fort Henry, were not too well chosen, and in both cases the fortifications were too large for defence by a small garrison, and rather resembled entrenched camps. The two posts, which were under the command of General Tilghman, who had placed a garrison of 3,000 men in Fort Henry and of 2,000 in Fort Donelson, guarded the bridges, by which the railroad from Bowling Green to Columbus, connecting the two flanks of the Confederate position, crossed the rivers, and their importance was fully realised by the Southern commanders. Grant received his orders on the 1st February; and on the 3rd the expedition started from Paducah, forty miles below Fort Henry. Grant was in command of 15,000 men organised into two divisions under McClernand and C. F. Smith, and was supported by a fleet of seven gunboats under Foote, of which four were ironclad. By the 5th the whole force had arrived, and Smith's division was landed on the left bank, where it occupied a high bluff overlooking Fort Henry. Not only was the Confederate position commanded from the opposite side of the river, but even on its own bank there were heights, which once secured by the Federals would have rendered the position of the garrison untenable. Under the circumstances Tilghman decided to send all the infantry to Fort Donelson and to retain in the fort only a company of artillery. His sole object was to gain time for the rest of the garrison to escape. On the 6th the fleet advanced to the attack and made short work of the Confederate defences. The fort was built so low that the guns were close to the level of the water. Various accidents befell some of the guns, and after an hour and a half's bombardment Tilghman surrendered. The infantry made good their retreat to Fort Donelson. The news of the capture of Fort Henry produced a great effect both in the North and South. It was the first great success won by the Federals, and it had been gained with startling suddenness. It was hastily assumed, that in its ironclad gunboats the North had an instrument of warfare with which the Confederate fortified works were powerless to cope. Albert S. Johnston on the following day gave orders for the abandonment of Bowling Green. He determined with 14,000 men to fall back to Nashville; at the same time he sent 12,000 men to reinforce the garrison of Fort Donelson. This latter step was a very strange one. It would probably have been Johnston's wisest course to concentrate as large a force as possible at Fort Donelson and fight Grant before he could be reinforced. A victory won over Grant would have been the surest means of protecting Nashville. For if once the Federals got possession of Fort Donelson, Nashville itself would speedily be at the mercy of their gunboats. But Johnston, when he sent nearly one half of his army to Fort Donelson, was not contemplating active operations in the field. He proposed to lock the whole force up within the fortifications, and he relied upon the ability of his subordinates to extricate their troops, when further resistance seemed useless. It is hardly surprising that General Floyd, whom he placed in command of the garrison, protested, though vainly, against the whole proceeding. Grant had hoped to capture Fort Donelson on the 8th. But the forecast was too sanguine. The fleet had to descend the Tennessee and ascend the Cumberland. It had also suffered some injuries from the guns of Fort Henry and needed to refit. As the rapid success at Fort Henry had been gained by the naval force, Grant did not feel himself justified in advancing upon Fort Donelson until it was able to co-operate in the movement. Not till the 12th did he move his infantry, now reinforced by a third division under General Lewis Wallace. The same night they arrived before Fort Donelson. The next day witnessed a good deal of skirmishing and desultory fighting, as the Federals were taking up their positions, trying to gain some knowledge of the ground and feeling the strength of the enemy. On the 14th the fleet attacked, but the result was very different to that anticipated. The batteries, unlike those at Fort Henry, were placed high above the water and were virtually unassailable. A bend in the river just below the fort enabled all the guns to be brought to bear upon anything which came within range. After a sharp action, the fleet was forced to retire. Two of the ironclads had their steering apparatus so damaged that they drifted helplessly out of action, and the other two also received severe injuries. No impression whatever was made upon the fort. On the 15th Grant left his camp to have a conference with Commodore Foote, who had been wounded, and it was decided that after the repulse of the gunboats it would be necessary to reduce the fort by regular siege operations. But on his return to his army Grant found that the situation had entirely altered. The Confederate garrison in Fort Donelson numbered 18,000 men. But its commanders, Floyd, Pillow, and Buckner, overestimated the strength of Grant's force, and believed that they were largely outnumbered, though they actually at the moment had a slight superiority in numbers over their assailants. Floyd had all along been opposed to an attempt to hold the fort; and he had special reasons for not wishing to become a prisoner of war, as he was liable to be tried for high treason for his conduct as Secretary of War in President Buchanan's Administration, and was actually under indictment at Washington for embezzlement of public funds. 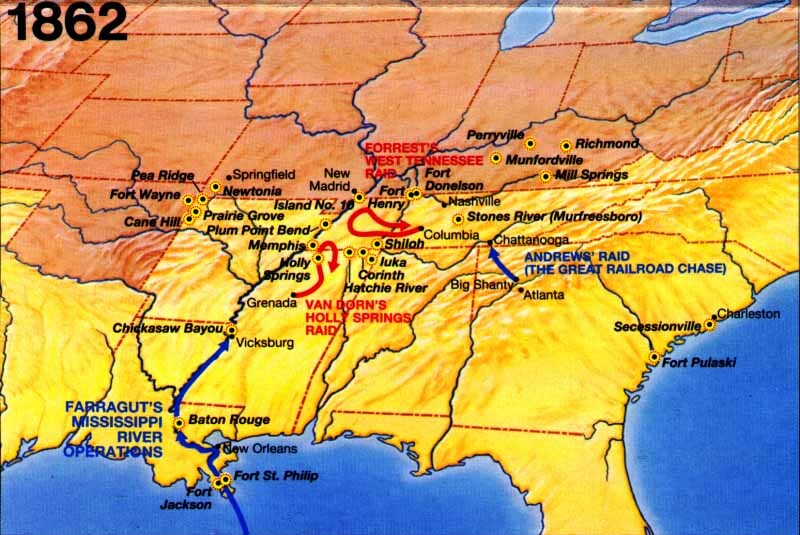 On the 14th the three generals decided to try and cut their wayout through the Federal Iines and reach Nashville. The repulse of the fleet that day failed to give them any increase of confidence. The attack was to be made on the morning of the 15th by Pillow's division, which was to break through McClernand's lines on the Federal right, and open the road to Nashville. Pillow was to be supported by Buckner, and the latter's division was to form the rearguard and cover the retreat. But no definite arrangements were made concerning the details of the retreat. It was not even settled whether it was to commence as soon as ever the road to Nashville should be opened, or whether the movement should be postponed till the night. No attempt was made to organise a train or provide a supply of food for the army. The attack proved successful. 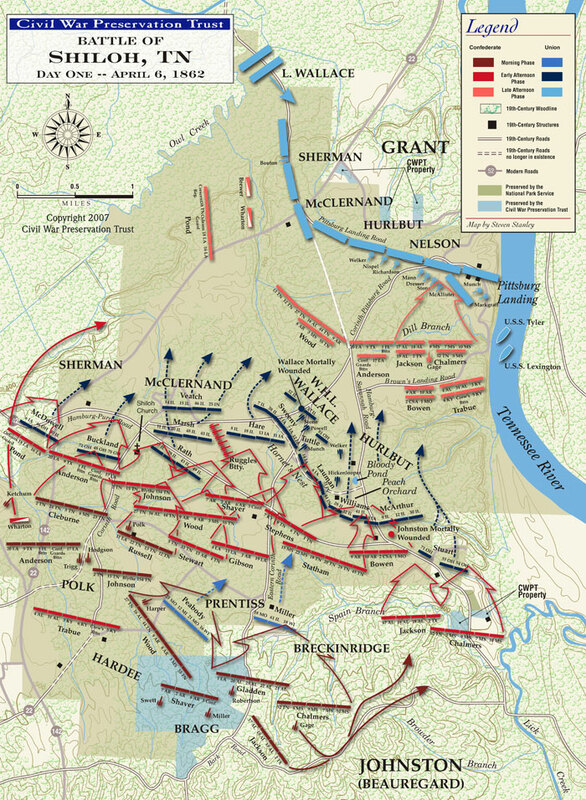 McClernand's division was rolled up and thrown back upon the centre, where Wallace's division was posted, and the road to Nashville stood open. But just at this point Pillow ordered his victorious troops to return to their own entrenchments. His idea apparently was that when the road had been opened, the retreat would not take place till after nightfall. Grant on his arrival promptly took in the situation. Though his right was beaten, he judged (wrongly, as a matter of fact) that the enemy must be a good deal demoralised by the fact that they had retired. He immediately ordered Smith, who commanded on the left, to assault the enemy's lines to "save appearances," and sent an earnest message to Foote, begging that the gunboats would at least make a demonstration against the fort. Evidently he realised the gravity of the situation, but his admirable composure encouraged his subordinates. Smith advanced with great gallantry, leading the charge himself. The first line of Confederate entrenchments was carried, being but feebly defended, as the greater part of Buckner's division had been withdrawn to take part in the attack upon McClernand. The Federals found that they had gained an elevation which was the key to the whole Confederate position. Buckner returning with his troops from the scene of the earlier fighting made strenuous efforts to regain this all-important point, but without success. At the same time as Smith advanced to the assault Grant directed McClernand and Wallace to retake the ground which they had lost in the morning. At nightfall the Confederate position had changed considerably for the worse. The line of their retreat was again closed to them, and Smith's successful assault had rendered their position in Fort Donelson untenable. The troops were demoralised and disgusted at having been recalled after their successful fight; and Grant was receiving reinforments. A Council of War was held that night. Buckner declared himself unable to hold his position, if the attack were renewed the following morning upon his second line of entrenchments. The boldest and, under the circumstances, the wisest course would have been to have made during the night all the preparations possible for a retreat, and in the morning to have made a second attack upon the enemy's right. Though the Federals had reoccupied their old position, yet the troops on the right were still McClernand's, which had been so severely handled already. It is probable that a considerable part of the garrison would have succeeded in cutting its way out. But the Confederate Ieaders were in a despairing mood: they had no confidence in themselves or in their soldiers. Floyd turned over the command to Pillow so as to secure his own escape. Pillow followed his superior's example. But Buckner was of sterner mould, and determined to stand by his troops. Having accepted the command, he at once sent to Grant to offer to capitulate on conditions. Grant replied with a demand for unconditional surrender. Buckner had no alternative but to comply, and on the morning of the 16th Fort Donelson surrendered. Floyd and Pillow left by steamer before the capitulation was concluded, and with them a certain number of infantry escaped also. Forrest, the cavalry commander, with the greater part of his command, escaped by road. A considerable number of stragglers also got away, but the number of prisoners of war amounted to nearly 12,000. The fall of Fort Donelson following that of Fort Henry within ten days filled the South with consternation. The disaster was all the more sudden, because the last news received had been a despatch announcing a great Confederate victory. A cry went up for vengeance upon the unsucccssful generals, especially Johnston, the Commander-in-Chief. But President Davis staunchly refused to dismiss a general whom he regarded with justice as one of the ablest officers in the Confederacy. The results of the surrender of Fort Donelson, both material and moral, were enormous. It secured Kentucky to the Federal cause: it laid Tennessee open to invasion: it necessitated the evacuation of Nashville and Columbus. The whole of the first line of Confederate defence in the West was swept away at a single blow. The South, with its feeble resources, coulld ill afford to lose the services of the thousands who had become prisoners of war. At the North the victory led to the expectation that the days of the Confederacy were numbered, and intensified the disappointment which was felt, when these earlier successes were not followed up. The double success, achieved with a rapidity which was in marked contrast to the methods of other Federal generals, laid the solid foundation of Grant's military reputation. It gained for him the trust and support of President Lincoln, whicii stood him in good stead afterward. Yet for the moment it was Halleck, the commander of the Department, who gained the chief credit for the success won by his lieutenant. It secured him shortly afterwards the supreme command in the West. But brilliant as had been the results of the expedition, it was open to severe criticism. When Halleck suddenly made up his mind to let Grant carry out the scheme, which he persistently advocated, he did not take the trouble to secure either the approval of McClellan, then Commander-in-Chief of all the Federal forces in the field, or the co-operation of Buell. As he expected, he forced the hand of the Government. McClellan was obliged to abandon his cherished scheme of an invasion of East Tennessee. But he had no troops which he could send to Halleck. Buell, who had been led to believe that Halleck would not make any movement up the Tennessee, had scattered his troops so much that it was no easy task to collect a considerable force, which might be sent to Grant's aid. Halleck himself imagined that he could spare no troops for the purpose from Missouri. Consequently, after the fall of Fort Henry, Grant found himself placed, by the ill-judged precipitancy of his superior officer, in a position of considerable peril. It would have been quite feasible for Johnston to concentrate a superior force against him. Had Beauregard (who had come from the East to command the troops on the Mississippi under Johnston, with headquarters at Columbus) been commanding the Confederate forces in the place of Johnston, that would have been the course adopted and a decisive victory would have undone all the effects of the capture of Fort Henry. Halleck's inconsiderate haste had forced his subordinate to run a great and unnecessary risk. Further, it caused a great deal to be left undone which ought to have been done. Grant had a large enough force under his command at Fort Donelson to have pushed up the Cumberland in pursuit of Johnston. But no attempt was made to follow up the Confederate retreat. For ten days after the fall of Fort Donelson Halleck remained without any plan at all. He had totally failed to grasp the full significance of Grant's success. So far from pressing on into the heart of Tennessee, and thereby turning the Confederate positions on the Mississippi, he was afraid that Beauregard would assume the offensive against Cairo, Paducah, and Fort Henry. He ordered Grant not to advance, but to send back the gunboats. But Commodore Foote, acting on his own responsibility, pushed up the river for thirty miles to Clarksville, which he occupied without resistance, and Grant sent C. F. Smith's division to take possession of that town. Buell had taken a long time to make up his mind as to the proper course for him to pursue with reference to Halleck's demands for help. He was by no means disposed to break up his army and send a considerable part of it to serve under Halleck's command. A rigid disciplinarian, he had brought the Army of the Ohio to a high state of efficiency, and was particularly anxious that its esprit de corps, so great an essential in a volunteer army, should not be impaired by the withdrawal from it of divisions to serve in other armies under other leaders. When he heard that Bowling Green had been evacuated he determined to send one division by water to Grant, and with the rest of his army to march direct upon Nashville. There can be but little doubt that Buell resented Halleck's action in sending an expedition against Fort Henry, and then suddenly calling upon him to send reinforcements to take part in the movement, which Halleck himself had led him to suppose abandoned. He had a general's natural desire to keep his fine army intact. At the moment of Grant's advance he was preparing for an advance into East Tennessee, to follow up Thomas' victory at Mill Springs, and it took him some time to concentrate his troops again for an advance on quite a different line. On the 24th February two of his divisions were in possession of Nashville, which Johnston evacuated after the fall of Fort Donelson. The conditions of the roads and streams convinced the Federal generals that it was impracticable to follow Johnston, who had retreated to Murfreesborough, although their united forces would have brought 90,000 men against the Confederate army of less than 20,000. On the 2nd March Columbus was evacuated by Beauregard's orders, and almost all the guns and a considerable part of the garrison were removed down the river to New Madrid and Island No. 10, in order to prevent the further advance of the Federal fleet. General Pope was sent by Halleck to attack this new position of the Confederates. As the pursuit of Johnston had been abandoned it was necessary for the Federal generals to devise some fresh plan of action. The right strategical course to adopt was to take such a position that Johnston would be forced either to fight a battle to save his line of communications, or, if he refused to do that, to abandon the Confederate cause in the West as hopeless. Above all, it was important to prevent Johnston at Murfreesborough from uniting with Beauregard, who was concentrating a force at Memphis and Corinth from the garrisons of the abandoned positions on the Mississippi. The Memphis and Charleston Railroad offered just such a position as the Federals required. If Johnston refused to fight for its defence, it would be possible to sever the West from the East and compel the Confederate forces in the West to fall back upon the Gulf States. At the same time the possession of the railway would enable the Federals to prevent the junction of Beauregard and Johnston. Both Memphis and the posts on the Mississippi above that city still retained by the Confederates would have to be evacuated when once Halleck and Buell were firmly established on the line, which connected the Mississippi with the Eastern States in the Confederacy. The Tennessee provided the Federals with a safe line of advance against the railroad. A movement up that river would bring them into close proximity to Corinth, a railway junction of extreme importance. At that point the Mobile and Ohio Railroad connecting the upper waters of the Mississippi with the Gulf States intersected the direct line of communication between East and West. A short distance west of Corinth, a second, the Mississippi Central Railroad, intersected the Memphis and Charleston line. The two lines from the south, joining at Jackson, ran northward through Humboldt and formed the overland line of communication, on which the Confederate forces in Island No. 10 and New Madrid depended for their supplies. At Humboldt a third line came in--the Memphis and Ohio Railway--which was already broken by the capture of Forts Henry and Donelson. Corinth, Jackson, and Humboldt were three points of strategical importance, but the first was by far the most important, as its capture would compel the evacuation of the other two positions. To the east of Corinth a tributary of the Tennessee was crossed by the Memphis and Charleston line near Eastport, and the destruction of the railway bridge at that point would seriously embarrass the Confederate movements. Buell formed a correct view of the strategical situation. He wished to unite his army and that of Halleck as far up the Tennessee as possible on the east bank, to cross the river and strike a blow in force at the railroad. Halleck, on the contrary, proposed to send his army up the Tennessee, but to confine its operations to making raids on the west bank against the Confederate lines of communication, with the exception of one division, which he intended to send against the railway bridge near Eastport. But the point on which he specially insisted was that under no circumstances was a general battle to be brought on; to avoid that, the differennt expeditions were, if necessary, to retreat. He entirely failed to see that the true objective of all his movements ought to have been the Confederate army in the West, and that its destruction was the one matter of vital importance. The consequence of these divided counsels was that after the occupation of Nashville the Federals made a very poor use of their opportunities. Buell's army remained at Nashville whilst Halleck made attempts against the Confederate lines of communication, which the condition of the roads and the inclemency of the weather rendered wholly unsuccessful. In the beginning of March, McClellan had been relieved of the command of all the armies of the United States in the field, in order that he might concentrate his attention upon the Army of the Potomac. On the 11th of the same month President Lincoln yielded to the urgent entreaties of Halleck, who, ever since the fall of Fort Donelson, had been clamouring for the sole command in the West, and appointed him the commander of a new Department extending from Knoxville on the east to and beyond the west bank of the Mississippi to be known as the Department of the Mississippi. This appointment placed Buell under Halleck's orders. Lincoln was unquestionably right to put an end to the system of dual control established by McClellan. A single commander-in-chief in the West ensured a much-needed unity of movement in the Federal operations. But as certainly Lincoln made a grave mistake in selecting for the command of the new Department Halleck in place of Buell. Still, for the time, Halleck had achieved his object, and was now Commander-in-Chief of the Federal forces in the West. Missouri, which had absorbed so much of his attention during the earlier stages of the war, had been permanently secured to the Federal cause by the victory of General Curtis at Pea Ridge over the Confederate general, Van Dorn, on the 7th and 8th March. Curtis followed up his success by marchiiig through Arkansas without encountering any serious opposition, and came out on the bank of the Mississippi in the following July. Halleck, in taking over his new command, had nothing to fear on the west side of the Mississippi. As his attempt to destroy the Confederate lines of communication on the west of the Tennessee had failed, he determined to carry out the plan of campaign which from the first had been urged upon him by Buell, now his subordinate. He directed the Army of the Ohio to move to Savannah on the east bank of the Tennessee with a view to uniting with Grant's army, which was concentrating at Pittsburg Landing, nine miles above Savannah on the opposite bank. The combined armies were then to move on Corinth, which wasas twenty miles distant from Pittsburg Landing. The position for the Federal camp had been selected by C. F. Smith, who had been temporarily in command of the advance up the Tennessee, owing to a misunderstanding between Halleck and Grant. It was a strong position, as the flanks were protected by the Tennessee and its tributaries, and could have been rendered impregnable by a single night's work at entrenching. But the use of entrenchments had not as yet been recognised by either combatant. There was, however, one cardinal defect about the position. It had no line of retreat. If the Confederates should concentrate a superior force against Grant before he was reinforced by Buell, the Federal army if beaten in battle would have no alternative except to capitulate. Johnston and Beauregard were quick to seize the opportunity. They saw a chance of defeating the largely superior forces at Halleck's disposal in detail. About the 18th March Johnston reached Corinth with 20,000 men, having marched from Murfreesborough by way of Decatur. He found there General Bragg, who brought a force of 10,000 men from Pensacola. Beauregard ordered his troops to assemble at the same point. On the 29th March Johnston formally assumed command of the Army of the Mississippi, as it was now styled, numbering about 40,000 men with 1000 pieces of artillery. Apparently Johnston had lost confidence in himself after his repeated failures to check the Federal advance, and urged Beauregard, the victor of Bull Run, to assume the chief command. But the latter refused to supersede his superior officer. The Confederate army was organised into three Corps under Polk, Hardee, and Bragg, all West Point graduates and soldiers of decided ability, with a reserve of infantry under Breckinridge, who had been Vice-President of the United States, when Buchanan was President. By the 1st April Grant had concentrated at and near Pittsburg Landing about 45,000 men. His army was divided into six divisions commanded by W. T. Sherman, Prentiss, McClernand, Lewis Wallace, Hurlbut, and W. H. L. Wallace--the last named was commanding in place of C. F. Smith, who had injured his leg so seriously that he was obliged to leave his command, and before the end of April he died of the effects of his accident. Grant laid himself open to severe criticism by continuing to keep his army at Pittsburg Landing, after the operations against the enemy's lines of communication had been found to be impracticable. The Landing had been selected as the temporary base for the operations, but it was the height of imprudence to turn it into a permanent camp within twenty miles of the enemy, unless it was strongly entrenched. But throughout this part of the campaign Grant displayed a sense of security which was strangely out of place. His easy successes had made him careless and unduly contemptuous of the enemy. He knew that they were collecting in force at Corinth. He ought to have realised that his exposed position gave them an opportunity which such able officers as Johnston and Beauregard were hardly likely to let slip. Yet he had made up his mind that the Confederates would not venture to assume the offensive. His own headquarters were at Savannah, nine miles away from his army and on the opposite bank of the river. No plan of battle had been arranged. The divisional commanders had been allowed to fix their camps, not with a view to mutual support, but as it suited the convenience of each commander. No systematic cavalry reconnaissances had been carried out along the roads leading to Corinth. There was no regular outpost line in front of the camp. Not a single precaution had been taken to guard against a surprise. It must be said that Halleck shared to the full the light-heartedness of his lieutenant. He suffered him to remain in his insecure position: he gave Buell no hint that the safety of Grant's army depended upon the prompt arrival of his forces. He proposed to come at his leisure to Pittsburg Landing to assume the command of the two armies concentrated there, and then to commence the advance on Corinth. He gave the Confederate generals no credit for enterprise or even common sense; he believed them to be committed to a purely defensive policy. Johnston was anxious to concentrate as large a force as possible against Grant, in order that he might inflict a crushing blow. Van Dorn, after his defeat at Pea Ridge, had been ordered to bring to Corinth all the troops that he could raise from Missouri and Arkansas. Johnston waited for his arrival as long as he thought safe; but on the night of the 2nd April, hearing that Buell was moving rapidly towards Savannah, he ordered an advance the following day. It was his intention to fall upon the Federal camp in the early hours of the 5th, but the wretched condition of the roads and the inexperience of officers and men prevented the troops being in position at the appointed time. Forrest's cavalry had encountered a certain amount of opposition, whilst leading the advance. Beauregard, when it became clear that the attack must be postponed, was in favour of abandoning the whole enterprise and of returning to Corinth, believing that the Federals must know of their advance and were decoying them into a trap. Johnston, however, resolved to go on. His army had come to fight and not to retreat: another movement to the rear would destroy the confidence of the soldiers in their general and fatally impair the moral of his army. The attack was fixed for the morning of the 6th. Meanwhile Buell's army of five divisions, numbering about 37,000 men, was drawing near. It had been marching steadily but without undue haste, and had been delayed for twelve days at Duck River where a bridge had to be built. How completely Halleck had failed to impress upon Buell the need for promptly joining Grant is shown by the fact that Buell asked for and actually received permission to take his army not to Savannah, but to a landing-place opposite Hamburg, a town ten miles above Pittsburg Landing. It was by a mere accident that the orders to that effect miscarried. About noon of the 5th (Saturday) the leading division under Nelson reached Savannah. Grant, however, declined to send it across the river immediately, because he thought there would be be no fighting; some day early in next week would be time enough. About two miles out from Pittsburg Landing, upon the Corinth road stood Shiloh Church. There Sherman had his headquarters, and his division formed the right of the Federal army: in rear of him McClernand had pitched his camp. The centre of the position was held by Prentiss' division, half a mile from Sherman's left, across a second road leading to Corinth, and behind it lay Hurlbut's division, whilst more than half a mile beyond Prentiss, and resting upon the river, was Stuart's brigade, detached from Sherman's division. W. H. L. Wallace's division was still further to the rear, and Lewis Wallace's was at Crump's Landing, some five miles further down the river. Two gunboats in the river served to strengthen the left flank. About 6 a.m. on the 6th the battle of Shiloh commenced. At 3 a.m. on that Sunday morning Prentiss had sent out a brigade to reconnoitre. This force suddenly encountered the Confederate advance under Hardee, and was quickly driven in. So swift was the onslaught that the Federals were quite taken by surprise. The fighting, which lasted throughout the day, was at first a succession of independent battles waged by the different divisions. The Federal front line, held by Sherman's and Prentiss' divisions, was promptly driven back upon the divisions in their rear. The ground was thickly wooded, broken by swamps and ravines, and naturally favourable to the defensive. The Confederates, being raw soldiers and led by inexperienced officers, did not keep their formation very accurately. A good many seem at once to have left their ranks in order to plunder the captured camps. The Federals consequently found time to form a second line of defence. But the lack of organisation now made itself felt. Their line was divided into three distinct sections at some distance from each other, so that the flanks of the respective divisions were open to a turning movement. On the right Sherman's and McClernand's divisions stubbornly resisted the onslaught of Hardee's and Polk's Corps. Their right was covered by Owl Creek, but their left flank was completely exposed. As the attacking line extended, the Federals were forced to fall back from one position to another to escape being driven into the Creek, on which their right rested. Eventually they took up a position on Snake Creck, into which Owl Creek runs, covering the bridge, by which Lewis Wallace's division was expected to arrive from Crump's Landing, and this they held to the close of the day's fighting. In McClernand's report it was stated that this was the eighth position which his troops had occupied since the fighting began. In the centre the divisions of Prentiss, Hurlbut, and W. H. L. Wallace held a very strong position known as the "Hornets' Nest." Up the wooded slope the Confederate right, composed of Bragg's and Breckinridge's commands, was hurled again and again in unavailing charges. Johnston had left Beauregard in general charge of the whole field to take under his own personal direction the movements of the right wing. He directed a succession of frontal attacks against the Hornets' Nest, which was practically impregnable to any but a flank movement. About 2.30 p.m. he was killed, and Bragg succeeded to the command of the right wing. He initiated a flanking movement, which was rendered the easier by the withdrawal of Stuart's brigade, forming the left of the Federal line, about 3 p.m. Hurlbut, whose division formed the left centre, finding himself outflanked, fell back to the Landing. By his withdrawal Prentiss' left flank became exposed, and that general was forced to change front. He and Wallace, however, continued to hold their position with great resolution until about 5 p.m. Polk moved his corps over from the left to Bragg's assistance. Wallace himself was killed, but nearly all his division made good their retreat. The remnant of Prentiss' division, however, was surrounded and forced to surrender. But this obstinate resistance had given time for the sorely needed reinforcements to come up. Nelson's division had been hurried up from Savannah to a point opposite Pittsburg Landing, and there was ferried across. By 5:30 p.m. the leading brigade was in position behind a deep ravine covering the Landing. Grant had got together some twenty guns to hold this last position, and such of his infantry as he had been able to rally. But the bluff overlooking the river was crowded with an ever-increasing stream of fugitives, whose numbers have been estimated as high even as15,000. Against this last line of the defence Bragg was advancing to complete the defeat of the Federal army. But the sun was already sinking, and Beauregard, who after Johnston's death had succeeded to the command, determined to draw his troops off. In his judgment it was too late in the day to hope to gain any further success, and he wished to give his soldiers a good night's rest in view of the hard fighting which lay before them next day. His orders reached one of Bragg's divisions in time to prevent its further advance. But the other division, moving before Beauregard's order arrived, went in to the assault with the utmost gallantry. But it had no supports: the ammunition supply ran short, and all its efforts were powerless to carry it across the ravine in the face of the heavy artillery fire and Buell's troops, now engaged for the first time during the day. The gallant but useless struggle was continued until nightfall, when the Confederate division withdrew. The battle of Shiloh, like the First Bull Run, is typical of encounters between volunteer armies. It was the first pitched battle fought on a large scale in the West. On both sides the lack of discipline and the unrestrained instinct of the individual to think for himself and to take such steps as seem most likely to secure his own safety were to be seen in the large number of stragglers, and of men who, not from cowardice but simply from lack of military habit, left their ranks and moved to the rear when the case seemed hopeless. This was especially noticeable in the case of the Federals. The stream of fugitives increased with each successive movement of tbe sorely pressed divisions to the rear. It has been estimated that at the close of the day's fighting Grant had not more than 12,000 men under arms (including Lewis Wallace's division from Crump's Landing, which took no part in the fighting of the 6th). This feature was not so noticeable on the actual day of battle in the Confederate ranks, as they were acting on the offensive and buoyed up by the hope of winning a signal victory. And, indeed, the vigour with which the Confederates attacked at Shiloh contrasts favourably with the methods of the Federals, when they were the attacking force at Bull Run. But after the fighting was over and it was recognised that the attempt to annihilate Grant's army, before it could be reinforced, had failed, there was a steady stream of fugitives anticipating on their own responsibility the order for a general retreat on Corinth, which reduced Beauregard's force for the next day's fighting to 20,000 men. Nor was the conduct of the commanding officers on either side above criticism. Grant exercised but little personal control over the course of the battle. He showed himself at the different parts of the field, and did his utmost to encourage and rally his beaten troops. But throughout the day on the Federal side the absence of a single controlling mind was noticeable. Johnston also failed to display any marked tactical ability in the handling of his troops. The original plan had been that the Federal left should be turned, and the whole army thus forced away from the river, on which their hope of reinforcements depended. But Johnston, by committing himself to a succession of frontal attacks against the almost impregnable position of the Federal centre, abandoned the original plan, and caused his troops to suffer very heavy loss without obtaining any counterbalancing advantage. During the night of the 6th Lewis Wallace's division arrived from Crump's Landing. Its late arrival was due to a misunderstanding. Three divisions of Buell's army were also brought across the river, and by the morning of the 7th Grant had under his command 25,000 fresh troops, who had not borne the burden and toil of the previous day's fighting. He ordered an advance against Beauregard's sorely tried troops as soon as it was light, and by 5 a.m. the battle was renewed. Beauregard on this day displayed tactical ability of a high order. He never allowed his army to become involved in a pitched battle, and yet whilst steadily falling back lost no opportunity of striking a counterblow at any Federal force which pressed too closely in pursuit. His retreat never degenerated into a rout. The fiercest fighting of the day was on the Corinth road between the Purdy road and Shiloh Church. For nearly six hours Bragg held his position there with splendid tenacity, and prevented the Federals from cutting the line of retreat to Corinth. Between 3 p.m. and 4 p.m. Grant, having regained the positions which his first line had held at the commencement of the previous day's fighting, desisted from any further attempt to crush the Confederate army. There was no apparent reason why he should not have pressed the pursuit till nightfall. But of neither of these two eventful days did Grant rise to the height of the occasion. The losses on both sides were very heavy; in killed and wounded they were nearly equal, the Federal loss being slightly over 10,000, whilst that of the Confederates was a few hundreds short of that number. But the Federal loss in prisoners and missing was much heavier than that of their opponents. In Prentiss' division alone 2,200 were taken prisoners. Having abandoned the pursuit on the afternoon of the 7th, Grant made no attempt to resume it, but waited at Pittsburg Landing for Halleck's arrival. The Commander-in-Chief joined his armies on the 11th April. He displayed no eagerness to advance, but preferred to wait until Pope's army should join him. Pope, with 21,000 men, had been sent to operate against the Confederate position at Island No. 10 and New Madrid, and after some very arduous work, including the cutting of a canal twelve miles long, forced the surrender of 7,000 Confederates on the 8th April. The only position on the Mississippi still held by the Confederates above Memphis was Fort Pillow, eighty miles below New Madrid. Pope had been originally ordered to continue his movement down the river and attack this post. But before he had actually commenced operations against it he was recalled to join Halleck, which he did on the 21st April. In spite of this reinforcement, which raised his army to 100,000 men, Halleck allowed another week to pass by before he commenced a very cautious advance on Corinth. 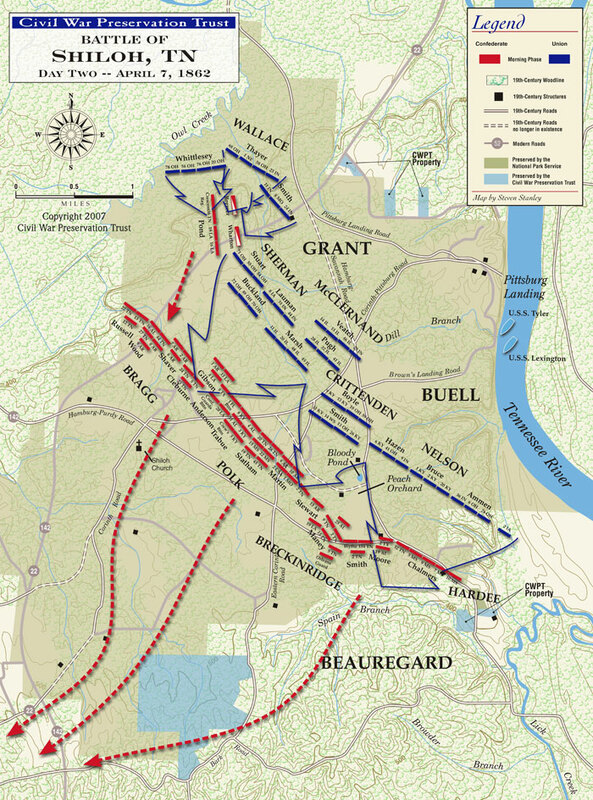 On the 1st May Beauregard was reinforced by 15,000 men brought from the opposite bank of the Mississippi by Van Dorn. The army under his command now numbered over 50,000, but he did not venture to give battle to a force double his own strength. Halleck's forward movement was a succession of slow approaches. He carefully entrenched each position, and impressed upon his lieutenants that under no circumstances were they to allow themselves to be drawn into a pitched battle. For over a month the operations against Corinth dragged slowly on until, on the 29th May, Beauregard, finding himself in danger of being hemmed in, evacuated the town in the night. The movement was quite unexpected by Halleck, and Beauregard withdrew the whole of his army in safety to Tupelo, some fifty miles to the south on the Mobile and Ohio Railroad. There he had the advantage of an excellent water supply and a salubrious climate; and his army, which had suffered considerably from sickness in its entrenchments at Corinth, rapidly recovered its health. The evacuation of Corinth necessitated the abandonment of Fort Pillow. The garrison was withdrawn on the 3rd June. The Federal fleet pushed on to Memphis, where, on the 6th, a Confederate fleet of gunboats and rams was encountered and destroyed, and the same day Memphis, from which the garrison had already been withdrawn, was occupied by the Federals. With the occupation of Corinth and Memphis, the spring campaign in the West came to an end. Much had been accomplished. The Federal army was firmly established across the Memphis and Charleston Railroad. The Mississippi had been opened to Vicksburg. Kentucky and West Tennessee were in the hands of the Federals. But there had been also much left undone. The opportunities for destroying the Confederate army had been signally missed. Before long that army was as strong as ever, and it was the Confederates who next assumed the offensive in the West. A keener controversy has raged over the battle of Shiloh than perhaps over any other battle of the Civil War. In the Federal ranks the longstanding jealousy between the Armies of the Tennessee and the Ohio finds free expression in the divergent accounts of the battle, which come from the partisans of one or other, and there has been no more damaging criticism of Grant's methods than that penned by Buell, commander of the Army of the Ohio. Similarly on the Confederate side, the admirers of Johnston and the enemies of Beauregard have sought to saddle the latter with the responsibility of the defeat, and have claimed that Johnston had won a victory, which Beauregard threw away after the commanding general's death. The first point at issue is the alleged surprise of the Federal army. Though Grant and Sherman have both denied that any surprise of their troops took place, yet it is impossible to ignore the overwhelming evidence to the contrary. It is probably enough that Bragg somewhat exaggerated, when he spoke (Johnson and Buel (editors): Battles & Leaders of the Civil War: p. 558) of many of the enemy being surprised and captured in their tents, but the undeniable fact remains that the Federal leaders were not expecting an attack, that they had made no preparations for such a contingency, and that the scouting on the Federal side was so slovenly that a great army was allowed to assemble within two miles of Sherman's headquarters without its presence as an army being detected. The surprise of the 11th Corps at Chancellorsville was hardly more complete than that of the Army of the Tennessee at Shiloh, though from a variety of causes the subsequent course of the fighting on the two fields followed different lines. Halleck, Grant, and Sherman were all three convinced that the enemy was definitely committed to a defensive policy, and that there would be no serious fighting until Corinth was reached. The initial advantage in the fight lay then with the Confederates, and was retained by them till almost the close of the day. The absence of the commanding general during the early stages of the, battle, which commenced before 6 a.m., whilst Grant did not reach Pittsburg Landing till after 8 a.m. at the earliest, combined withi the total lack of preparation for a possible battle, as is evidenced by the fact that one of Sherman's brigades was encamped on the extreme left two miles from the division to which it belonged, prevented the Federals from forming an organised line of battle and enabled the attacking force to defeat their opponents in detail. Grant, indeed, says (Johnson and Buel (editors): Battles & Leaders of the Civil War: p. 473) that "with the single exception of a few minutes after the capture of Prentiss, a continuous and unbroken line was maintained all day from Snake Creek or its tributaries on the right to Lick Creek or the Tennessee on the left above Pittsburg." The following brief summary of events, taken from Buell's Shiloh Reviewed (Johnson and Buel (editors): Battles & Leaders of the Civil War: p. 487-526), presents a different, and, it is believed, a more accurate account of the day's fighting. Skirmisming began with Prentiss' troops. Prentiss drew up his main line about a quarter of a mile in front of his camp, and held that position till the enemy passed him on the right to attack Sherman, whose left regiment immediately broke. Prentiss retired, renewed resistance in his camp, and then fell back in still greater confusion to the line, which Hurlbut and Wallace were forming half a mile to his rear. McClernand, owing to Sherman's left wing giving away, was unable to form his Iine until he had fallen back some 300 yards with the loss of six guns. Of Sherman's division Hildebrand's brigade on the left very soon disappeared. Buckland's brigade of the same division made a stout resistance of about two hours at Oak Creek, but with McDowell's on the right was ordered back to form a line on the Purdy road 400 yards to the rear in connection with McClernand's right. This effort was defeated; five guns were lost, and Sherman's division as all organised body disappeared. McDowell's brigade was the last to go, about 1 p.m. McClernand afraid, as all connection with the left was gone, of being cut off from the river, retired in the direction of the Landing, and about 3 p.m. took up a fresh position along the River road north of Hurlbut's original headquarters. In the meantime Stuart's brigade on the extreme Federal left had fallen back to a position in prolongation of and on the left of Hurlbut's, Wallace's and Prentiss' line in the Hornets' Nest, but without having any connection with it. The Federal centre held their position in the Hornets' Nest from 9 a.m. to 5 p.m. By 3 p.m. the right wing, consisting of Sherman's and McClernand's divisions and one brigade, sent to its aid by Hurlbut, had given way, and Stuart's brigade on the left had also fallen back. At 4 p.m. Hurlbut, owing to the pressure on his left in consequence of Stuart's withdrawal, fell back, and the Confederates, massing on both flanks as well as in the front of the Hornets' Nest, compelled the surrender of Prentiss and 2,200 men shortly after 5 p.m. When the last Confederate attack was made by Chalmers' and part of Jackson's brigades, Hutlbut was in line behind a battery of siege-guns posted half a mile from the river, but there was no organised resistance for a distance of 500 yards from the Landing. A rifled battery had been placed in position there, but the gunners were leaving their posts when Ammen's brigade of Buell's army arrived and repulsed the Confederate attack. The rifled battery could effect nothing against the attacking force, which was sheltered in the ravine, and the fire of the gunboats was equally harmless. Grant (Johnson and Buel (editors): Battles & Leaders of the Civil War: p. 475) states that "before any of Buell's troops had reached the west bank of the Tennessee firing had almost entirely ceased; anything like an attempt on the part of the enemy to advance had absolutely ceased." In proof of this view he cites the fact that Buell's loss on the 6th consisted of two killed and one wouiided, all the casualties being in the same regiment. Buell's contention, however, is that it was the presence of Ammen's brigade which prevented the final charge made by the two Confederate brigades from cutting off the Army of the Tennessee from the Landing. The nature of the battlefield, largely covered with wood and intersected by ravines, favoured the defensive and prevented the Confederates from utilising their cavalry for purposes of pursuit. This circumstance enabled the Federals to hold on till reinforcements arrived, but those reinforcements came not from Lew Wallace's division at Crump's Landing, but from Buell's Army of the Ohio. Grant also asserts (Johnson and Buel (editors): Battles & Leaders of the Civil War: p. 476) that victory was assured when Lew Wallace arrived, even if there had been no other support. Apart from the contention that Wallace's division would have been too late to save Grant's army, had it not been for the intervention of Ammen, the record of the next day's fighting seems to show, that with only Wallace's division to reinforce his beaten army, Grant would have been hard put to it, even to hold his ground against Beauregard. On the 7th the fighting on the left was entirely done by the Army of the Ohio, whilst on the right the honours were borne off by McCook's division of the same army. In an elaborate argument Buell maintains that the official map misrepresents the position of Grant's army on the night of the 6th. He says that this map extends Grant's line full half a mile too far to the west, placing Hurlbut's division on the front actually occupied by McClernand, McClernand's division on and 400 yards beyond Sherman's ground, and Sherman within the Iines occupied by the enemy. He goes on to say that the revision of the map made nineteen years later by Sherman is still more misleading, giving Grant a battle front of 2 1/2 miles instead of one mile at the most, not only extending Grant's line too far to the west but at least half a mile too far to the south. He considers that Sherman's line was not more than three-quarters of a mile from the river and more than a mile distant from the bridge over Snake Creek, by which Lew Wallace's division was expected, and which it could in no practical sense be said to cover. Amidst such conflicting testimony it seems impossible to arrive at any definite conclusion without avowing oneself a partisan of one side or the other. Ropes (The Story of the Civil War; A Concise Account of the War in the United States of America Between 1861 and 1865. Vol. II, 79-80) expresses himself very cautiously to this effect: "that this attack [of the two Confederate brigades], might have succeeded if it had been made before the troops from Buell's army arrived, is by no means improbable." One may perhaps go so far as to say, that without Buell's reinforcements Grant would not have won the battle of the 7th, whilst his position on the 6th might have been one of the gravest peril. On the Confederate side the rival claims of Beauregard and Johnston have been urged with a personal animosity happily lacking in the Federal controversy. Not only facts but also motives are called in question, and no important statement made by the one side is left uncontradicted by the other. The first point at issue is, to which of the two generals belongs the credit of conceiving the offensive movement against the Federal army at Pittsburg Landing. Colonel Johnston, A. S. Johnston's son, who was not himself at Shiloh and in his account of the battle seems to place much reliance upon a monograph furnished him by General Bragg, written, as, it would seem, with the express purpose of discrediting Beauregard, states that it was his father who fixed upon Corinth as the point of concentration and determined upon the offensive movement against Grant, whilst Beauregard, so he asserts, had all along favoured a defensive policy and wished to limit the movement upon Pittsburg Landing to a reconnaissance in force. On the other hand, Beauregard maintains that from his arrival in the western theatre of war he advocated an offensive policy, but that Johnston was steadily opposed to it, and that only with great difficulty did he persuade Johnston to join him at Corinth instead of continuing his intended retreat on Stevenson. There is no doubt that the Confederates were a day late in making their attack, and if it had been made on the 5th, as originally designed, their chances of success would have been greater. For this delay Colonel Johnston holds Beauregard to blame. He states that the orders for the march issued from Beauregard's headquarters were not the same as those which Johnston had originally approved, and that the change was the cause of the delay. Beauregard maintains, and his contention is supported by the evidence of two of his staff, General Jordan, Adjutant-General of the army, and Colonel Chisolm, that the orders issued on the morning of the 3rd were those approved by Johnston on the previous night, and that the delay was due to the misconduct of the Corps commanders. Beauregard claims that as soon as fighting commenced on the 6th Johnston gave him general control of the field and confined his whole attention to the extreme right. On Beauregard's theory Johnston's death did not cause any appreciable Iull in the combat; perhaps there was an interval of fifteen minutes whilst Bragg was organising a movement to outflank the Hornets' Nest. Colonel Johnston holds that his father exercised a general control over the whole field of battle up to his death, and speaks of him as being on different parts of the field at different times. He considers that Johnston's death caused a lull of over one hour in the battle, and that after that melancholy event there was no longer any sign to be found in the Confederate ranks of that unity of purpose and combination of movement which the presence of Johnston on the field had thus far ensured. After the capture of Prentiss and his troops Colonel Johnston states that "all the Corps commanders were at the front and in communication: a line of battle was formed, and all was ready for the last fell swoop." According to Bragg, that final assault was never made, as Beauregard "at Shiloh, two miles in the rear," sent orders for the withdrawal of the troops. According to this view it was not Grant's reserve artillery or Ammen's infantry brigade which saved the Federal army, but Beauregard's fatal order issued under a misconception of the state of affairs at the front. Beauregard, however, contends that after Prentiss' surrender "no serious effort was made by the Corps commanders to press the victory. The troops had got out of the hands either of Corps, divisional, or brigade commanders, and for the most part at the front were out of ammunition. Before the order (for withdrawal) was received, many of the regiments had been withdrawn out of action, and really the attack had practically ceased at every point." Colonel Chisolm states that he was on the extreme left with Hardee till almost dark, up to which time no orders had arrived to cease fighting. There seems, however, some doubt as to the reason which led Beauregard at 6 p.m. to call off his troops. According to his own account he knew that Buell's advance-guard had crossed the river, and he therefore withdrew his troops to make preparations for the defensive battle which he knew would take place next day. But according to General Jordan's version, a telegraphic despatch had been received at the Confederate headquarters to the effect that Buell was marching towards Decatur, and Beauregard called off his troops because he felt sure of being able to annihilate Grant next day at his leisure. Of these two utterly contradictory versions of the battle of the 6th, the evidence seems on the whole to favour Beauregard's. The animus in Colonel Johnston's narrative is very marked. General Johnston at the opening of the war was regarded as the ablest soldier of the South. His failure to hold Kentucky and Tennessee caused dismay and astonishment, and his friends and admirers were anxious to represent their hero as stricken down in the moment of gaining a victory, which would have retrieved all his previous disasters. For that purpose it was necessary to cast the blame of throwing away the victory, which was as good as won, upon Beauregard.